I will highlight things that make my life either easier or more rich. In some instances, you find something that does both. BAM! First example – Banded hair bands. (http://www.banded2gether.com) My friend, Laura, introduced me to Banded this year. It tamed the Sloth Hair. I have this little half-inch section of hair right in the front that has been dubbed my “sloth hair.” It can wiggle its way free from any hairstyle I do. No matter how many bobby pins or how tight I braid my hair, it will wiggle out. It got its name when I was in college. I was being goofy with my roommates who were several floors below in a parking lot. I stuck my head out the window and yelled, “Heeey Yoooou Guuuuys! !” like Sloth on The Goonies. (Because that is what you do when you have finals to study for and don’t want to.) The hair had wiggled out and was flapping in the wind. Hence my annoying hair’s nickname “Sloth.” Anywho – Sloth was tamed and I never had to tuck or pin it back all day. No Pain. And Speaking of my sweet girl, Ella, she suffers from migraine s. Because of this, she usually can’t wear her hair in a headband or even in a ponytail for very long before it makes her head start to hurt. She didn’t have the first issue with her Banded. She wore it all day pain-free. She forgot she even had it on at bath time! For a little girl who has been longing to accessorize – this is HUGE! For a mama who has wanted to be able to do something to get her hair out of her face – this is HUGE! They are not just headbands. I love me a good headband, but that isn’t all there is to Banded! 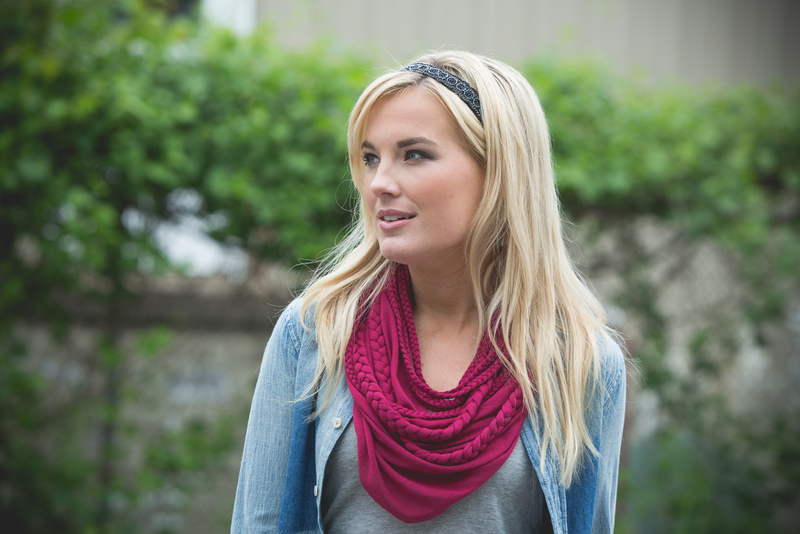 They have expanded their product line to include scarves, tees and more. I have the Beach Party Layered scarf and it is fabulous. It is sooo soft and lightweight. Their tees are also made out of super soft fabric that is down right luxurious. Rewards for their Customers. Not only are they generous with these charities, they are generous with their customers. They have a referral program to help spread the word. When you become a BANDED Ambassador, you receive a $3 reward for EVERY friend that purchases through your referral! It’s as simple as that and there is no limit to how many friends you can refer or how many rewards you can earn! Absolutely GREAT cause. That last but certainly not the least reason I LOVE Banded is because they support 2 wonderful ministries. The first is Amazima Ministries, that helps provide meals for children in Uganda. Each product purchased provides 3 Meals for Amazima’s daily feeding programs. So far this year Banded customers have helped provide over 1.6 MILLION meals! And their goal is to provide 5 MILLION this year – it is their 5/15 campaign. How AWESOME is that? They also give 10% of all on-line purchases to the T.J. Martell Foundation. The T.J. Martell Foundation is the music industry’s largest foundation that funds innovative medical research focused on finding cures for leukemia, cancer and AIDS. I don’t know about you, but the idea of getting a quality product that is incredibly stylish AND gives back in a very BIG way, is awesome! More reasons to LOVE Banded!!! They have further broadened their line of fab headbands. Case and point – my new Winter headband that kept my ears toasty (and stylish) while Ethan and I went sledding yesterday. I also got my little hands on their new athletic hand bands that are coming out. Y’all….so cute and so comfortable. One is made with a special wicking fabric that is reversible. Two headbands in one!! While another one has an exclusive odor reducing liner made with bamboo fabric. You read that right…bamboo.